To express your special wishes, this bouquet brings together beautiful blooms in an elegant display. 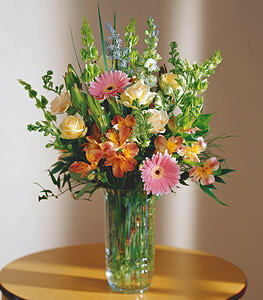 Vased arrangement includes creamy roses, pink gerbera daisies, and peach alstroemeria with white larkspur and Bells of Ireland. Assorted greens add the finishing touch.